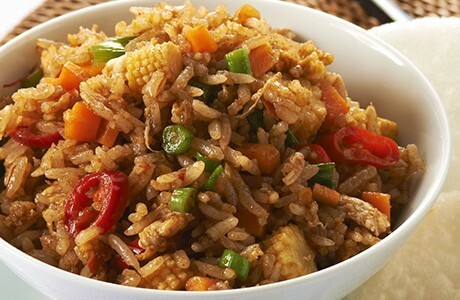 A simple to prepare recipe, this Chinese fried rice uses pre-cooked long grain rice allowing it to be ready to eat in minutes. Crispy, stir fried vegetables ensure this dish is perfect for vegetarians. Add the beaten egg to a heated wok and cook briefly. Add the vegetables and cooked rice. Add the Hoi Sin sauce and mix well, loosening with water if required. Season with salt & pepper to taste and serve hot.